Munich, Germany, June 20, 2018 --- At EES, Intertec is launching a range of ultra-robust enclosures for protecting field-based energy storage and electronics equipment. To minimize the long-term cost of ownership of field-based equipment in this fast-growing market, the enclosures employ advanced composite-GRP (glass fibre reinforced polyester) structural materials. Moreover, they can be fitted with a complete choice of coolers to optimize battery performance and reliability - including fully-passive systems which operate without electric power. Intertec expects GRP to succeed because of the immense track record this material has in the processing industries. GRP enclosures have become the preferred solution for process control and instrumentation protection in the most demanding outdoor applications in the world today. These applications include extreme environments such as the Arctic Circle, deserts, and coastal and offshore locations. Intertec has more than 50 years' experience of developing GRP enclosures for such applications and has a large portfolio of advanced composite-GRP materials to cope with the environmental protection challenges they present. In addition to these attributes, Intertec will design and fit enclosures with custom internal environmental controls - such as the temperature regulation that is often required to optimize the life of battery systems. Options include unique passive and hybrid cooling systems - which eliminate or reduce the need for electric power and provide project design engineers with exceptionally reliable solutions. Two main passive cooling technology options are available. Pure passive cooling systems for field enclosures from Intertec include a water circulation system with internal and external heat exchangers. The technology works by exploiting the temperature swing over the daily cycle. The water is cooled during the night when temperatures are lower. The cool water then reduces the enclosure's internal temperature during the day. Natural convection moves the water around the system. This solution is widely used today in arid and desert application environments, and Intertec has built many hundreds of this type of field shelter. When configuring passive cooling systems a critical parameter is night temperature. This provides the driving force for the natural circulation that transports heat out of the enclosure. The lower the night temperature, the more efficient passive cooling becomes. 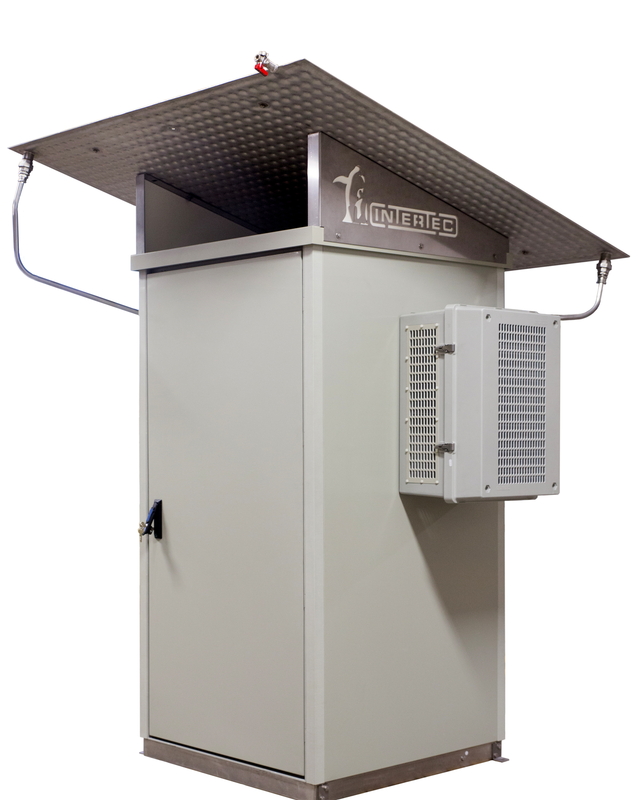 By adding one or more active, powered cooling elements, Intertec can create hybrid cooled enclosures and shelters that can be used in many different climates - from arid to temperate or even equatorial regions. Hybrid passive cooling can be easily achieved by adding a water chiller such as Intertec's Hybricool unit. This direct water chiller reduces the temperature of the water tank whenever electricity is available - from the grid or solar power. If the electricity supply should fail for any reason - or the water chiller should fail - the passive element of the cooling system will continue to operate and keep the energy storage system and electronics equipment cool, providing plenty of time for maintenance staff to visit the site and make repairs. In addition to passive and hybrid passive cooling, Intertec can fit enclosures with conventional powered cooling systems such as air conditioners - including specialized versions for operation in hazardous areas. 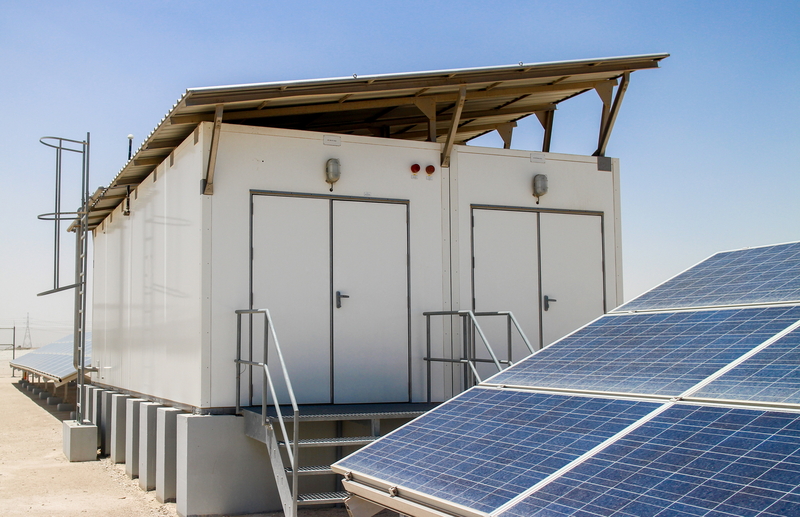 "The renewable energy industry is still at a relatively early stage and we have seen a number of companies protecting outdoor equipment using ad-hoc outdoor protection solutions such as adapted containers", says Intertec's CEO Martin Hess. "GRP materials, and particularly specialized composite-GRP variations, have an unparalleled record in providing long lifecycle protection and offer designed-for-purpose protection solutions for housing control electronics and energy storage systems." 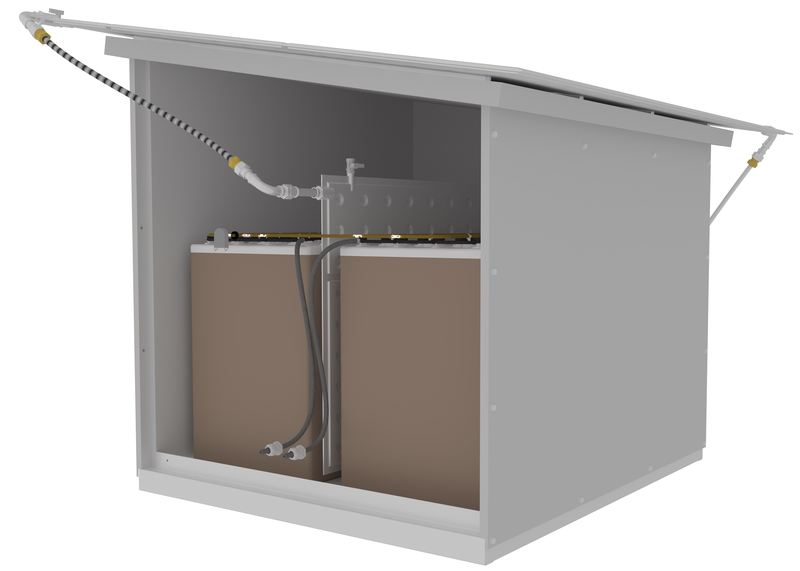 Intertec's new enclosures for field-based energy storage equipment includes options with passive or hybrid-passive cooling systems - providing project design engineers with exceptionally reliable solutions. A typical field shelter layout for field-based systems - with separate compartments for batteries and electronics equipment, both cooled using passive technology. Intertec's new enclosures for protecting field-based energy storage and electronics equipment can be fitted with hybrid-passive cooling options - using a combination of both active (powered) and passive cooling elements.